Winemaker’s Notes: Violet-intense purple, concentrated and bright. A complex nose with varietals notes of ripe fruits, figs, prunes, jam, and raisins. A good body, with sweet tannins and well-balanced acidity. A linger and complex finish. My Review: Let’s jump right into this one, shall we? The wine was a deep purple color, and on the nose I picked up aromas of ripe fruits, jam, and raisins. In the mouth I picked up tart cherry, with some sweet tannins balanced by a touch of acidity at the finish. The wine has been done in stainless steel tanks, and the crisp, clean, tart notes really show that off – there’s no mellowing of the flavors from time in oak. My wife and I paired the wine with steak and mac n cheese (because we’re classy like that/we had leftover hurricane supplies and hadn’t gone to the store). The wine paired well enough with the steak, though I think I would have liked it to be slightly less bright with the meat. Maybe with some pork or grilled chicken it would be better. 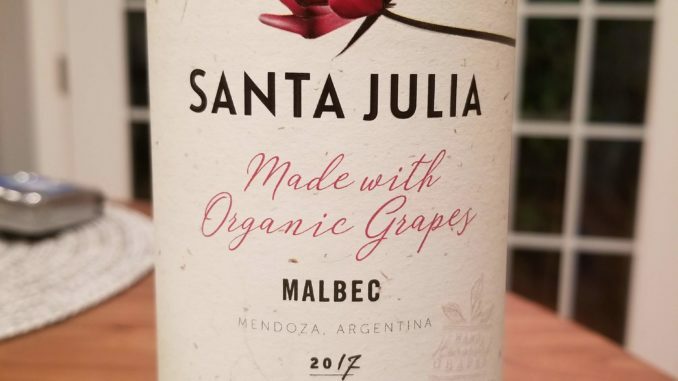 I liked this wine, but didn’t love it. That being said, for $11 it’s hard to argue against picking it up; I’ve paid more for Malbecs that I enjoyed less, so you’re not wasting your money on this one. Great for an evening at home.